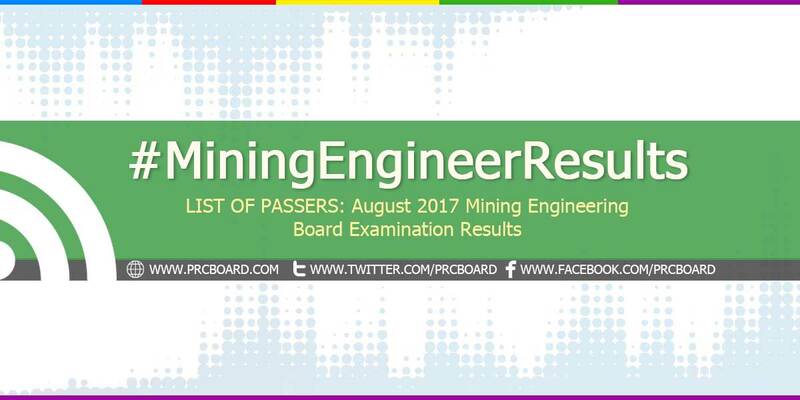 MANILA, Philippines – The August 2017 Mining Engineer board exam results together with the list of passers, top 10 examinees, top performing schools and related announcements are available at this website as PRC officially released the results online two (2) working days after the last day of board examination. As announced, 281 out of 317 passed the exams. The licensure exams are administered by PRC Board of Mining Engineering headed by its Chairman, Cornelio Q. Casido and its members Rufino B. Bomasang and Augusto C. Villaluna on August 8-10, 2017 at PRC testing center in Manila, Baguio, Cagayan de Oro, Cebu and Legazpi. The schedule of online appointment for issuance of Professional ID and Certificate of Registration will start on August 17, 2017. According to the Commission’s Resolution No. 2016-1019 series of 2016 entitled “Schedule of Licensure Examination for Year 2017”, the target release date of August 2017 Mining Engineer board exam result will be in two (2) working days after the last day of board examinations or by August 14, 2017 (Monday). However, results may also be released earlier or later without prior notice. On the same board exams administered by PRC on August 2016 results were out after one (1) working day while two (2) working days on August 2015. Mining Engineering is one of the programs with less number of examinees being administered by PRC. On the same exams conducted August 2016, 211 out of 259 examinees passed. Nestor Dela Cerna Opeña Jr. from CARAGA State University - Butuan City ranked first having 89.80% rating followed by Donna Mae Parpan Longga from Bicol University - Legazpi garnering 88.55%. St. Louis University was the only school in the top performing schools' list having 48 out of 60 examinees passed or 80.00% overall passing rate. During August 2015 Mining Engineer licensure exams, 173 out of 214 examinees passed. UP Diliman and St. Louis University were the top performing schools having 97.06% and 87.50% overall passing rate respectively. Reginald Patilla from Cebu Institute of Technology ranked first in the exams having 89.60% rating. He was followed by Mark Joseph Duhaylungsod Abing from UP Diliman garnering 89.10%. Meanwhile, below is the table showing the number of examinees, total number of passers and overall passing rate in the last four (4) years, courtesy of PRC. To receive up-to-date news about Mining Engineering results for August 2017, we advise our visitors to bookmark this page, visit PRC official website or follow us at our social media pages via Facebook and Twitter.